Over the past decade, Americans have become interested in owning bidets. But the average bathroom doesn’t have space to add another fixture similar in size to a toilet. Instead, they are buying TOTO Washlets, easy-to-install appliances that vastly improve the toileting experience. Let’s take a look at two of the most popular models to see which one will best fit your needs. How many times have you sat down on a cold toilet seat and wished it was heated? Or felt aggrieved that you were running out of toilet paper yet again? And if you’re suffering with hemorrhoids or other sensitive conditions, using the toilet can be quite painful. The solution to these problems is simple. So simple, in fact, that you can install it in a few minutes without a plumber. The TOTO Washlet C100 is the base model bidet that fits right onto your traditional toilet and turns it into something terrific. What can the C100 do? For one, it has a heated seat. You can choose the temperature you prefer to use. Then when you’re gone during the day, the C100 enters energy-saving mode so that you aren’t heating the seat when you don’t need it. Two, the main feature of the washlet is its ability to wash your underside after you’ve used the toilet. It does this by extending a wand that sprays water upward. The wand only emerges when the seat detects that someone is seated. You can adjust the water pressure and temperature, but it never gets hotter than 97 degrees, so it won’t burn sensitive skin. The water can be set to oscillate (but not pulse, like the C200 can do) for a better clean than a simple stream. It’s simple to set the controls using the panel mounted on the side of the seat. Unfortunately, there are no individual user settings. And if you prefer using a wall-mounted remote control, take a look at the C200 below. Finally, the C100 comes with both an automatic deodorizer and an air dryer with customizable temperature. You might not even need paper when you’re done, although some users comment that air drying takes a long time. 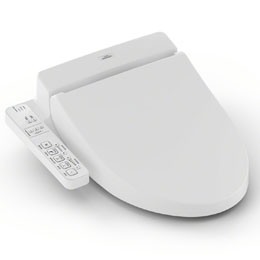 If you liked the Washlet C100, but would prefer a remote control, user profiles, and more options for controlling all the features, you’ll want the C200 instead. The TOTO Washlet C200 lets you customize your experience better. For example, you can create two individual users so you and another person can pre-set the temperature for the seat, the water, and even the air dryer. There are five temperatures available for each feature. Then you can also select the ideal water pressure and whether the spray oscillates and pulses. Some users comment that using the oscillating and pulsating spray seems to perform better cleaning. Many customers also prefer having a wireless remote control instead of a side panel like the C100 has. The remote control for the C200 has backlit buttons and it’s pretty intuitive to use. It comes with adhesive to mount it on the wall if you like. Other than these new benefits, the C200 has a SoftClose lid to prevent noisy bangs, and it’s easy to remove from the toilet for cleaning. Plus, when it’s not in use for a prolonged period, it enters an energy-saving mode. A TOTO Washlet is an ideal way to include a bidet in your bathroom routine without making modifications to your current plumbing. Both the C100 and C200 are simple to install without professional help, and they are easy to use, too. If you would like a gentler, more complete clean after using the toilet, a Washlet is the answer. Not to mention all the other comforts like a heated seat and a lid that won’t bang shut. If you want to customize settings for two user profiles and have more control over water temperature and pressure, get the C200. It has a separate remote control with backlit buttons and you can mount it on a nearby wall. Otherwise, you get the C100. Although it has a seat-mounted control panel and fewer settings, it’s well-liked by customers. Click here to Check out TOTO Washlet C100 Price on Amazon.com! Click here to Check out TOTO Washlet C200Price on Amazon.com! Why not enjoy a soothing water cleanse after using the toilet? You’ll use less toilet paper, keep your toilet more sanitary, and walk away from the bathroom feeling fresher. 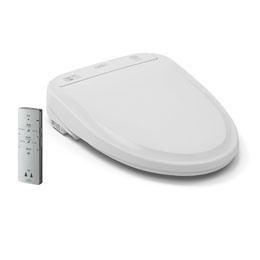 Let’s look at two bidet toilet seats from TOTO to see which will be the best for your home. 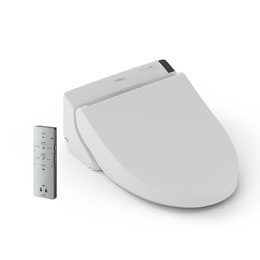 The TOTO Washlet S300e turns your toilet into a bidet. But this is no ordinary bidet that you’ll see in European restrooms. Instead, this one not only washes you, it can also dry you afterward. Plus, it has a heated toilet seat and an automatic air deodorizer. For all these features, the S300e is simple to install. You won’t need to modify your existing plumbing or bathroom appliances. It comes with mounting hardware in the box. You may have noticed the “e” in the model number. This represents ewater+, electrolyzed water that sanitizes the toilet bowl and the water wand each time you use the bidet. The S300e also pre-mists the interior of the bowl beforehand so that waste won’t stick to it. The S300e lets you customize several options for your comfort. You can perform both front and rear water cleanses with water that pulsates for a better clean. The remote control also allows you to choose one of five temperatures for the water, the seat, and the air dryer. Once you’ve found the perfect combination, save it as one of two preset user profiles. Don’t worry about the hot water running low—it’s heated as you need it so you never run out. And the maximum temperature is set low enough to never burn skin in sensitive areas. While you’re gone during the day, you can program the time the S300e enters the power-saving mode. Or the Washlet is smart enough it predicts when it can go into eco-mode by itself. If the S300e is so nice, why would you choose the S350e instead? There are a couple of reasons why you might prefer this TOTO Washlet over the prior one. For one, it has a nightlight. And two, it has an automatic lid (and seat) opener and closer. Just like the other Washlets from TOTO, the S350e is an appliance you can install yourself without a plumber. It comes with all the mounting hardware you need. Just make sure the measurements suit the toilet you have. 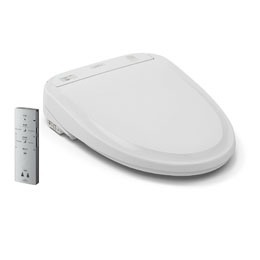 The 350e has ewater+, the electrolyzed water compound that sanitizes both the toilet bowl and the water wand after each use. It helps keep the toilet fresher, too. Speaking of clean and fresh, this bidet pre-mists the interior of the bowl before you use it. This way waste products don’t adhere to the sides. As for its ability to give you a better cleanse after using the toilet, the S350e excels. 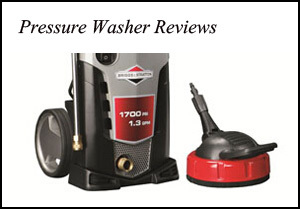 It performs both front and rear washes with a wand that emerges to spray warm water upward. The front wash has been redesigned to work over a larger area and flow more gently. But don’t worry about the water wand making a mess—the onboard sensor won’t let it function unless there’s weight on the toilet seat. The built-in instant water heater will always have water ready for you to use. With the remote control, you can select the perfect temperature for the water, the air dryer, and even the seat. There are five settings for each feature. And lots of users are happy with the S350e because its pulsating water stream gets them cleaner than traditional bidets can. The remote, with its backlit buttons, also lets you open and close the seat and/or lid. Plus, you can use it to program the perfect settings for two individual users. For the most deluxe hands-off toileting experience, get the TOTO Washlet 350e. It can automatically raise and lower both the seat and lid and has a built-in nightlight. If you don’t need those two features, but want everything else that a toilet bidet can do for you, get the Washlet S300e. Click here to Check out TOTO Washlet S300e Price on Amazon.com! Click here to Check out TOTO Washlet S350e Price on Amazon.com!